Behold the wonder of Decorative Tiles! 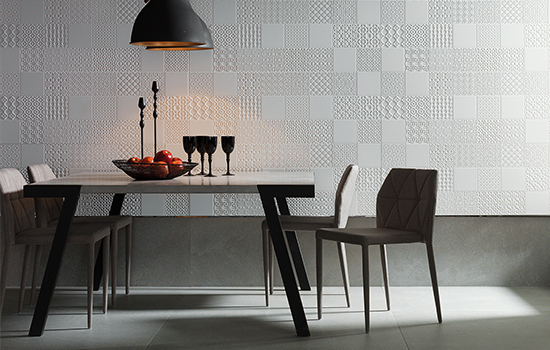 There is nothing quite like the feeling decorative tiles impart to a room. Consider tiles that are not only square but chevrons, zigzags, sunbursts, and anything that suggests movement. 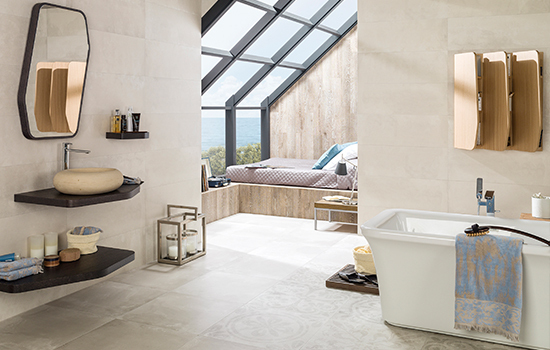 Decorative tiles add color, beauty and flair to every décor. Many tiles are available in 23”x23” squares but also consider smaller formats like Toscana Bone which is 18”x47” and lends a much different flavor to the room. Shown here is the striking and complementary blend of Deco Harlem Caliza on the walls and Harlem Caliza tiles on the floor. 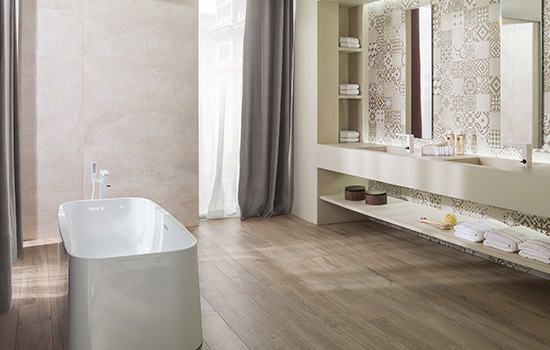 Pictured here is our lovely Toscana Bone porcelain wall tile showcased in a modest master bath. It’s neatly paired with Toscana Deco wall tiles interspersed with stunning mirrors. The vintage look evokes memories with its decorative patterns. Given the popularity of the color grey, we might change this design up by using Toscana Stone tile on the wall. Decorative tiles work particularly well on walls—whether as a small panel, an entire wall or a backsplash—while others are ideal as a decorative border. Decorative tiles are the perfect way to add flair to any space, whether you’re updating a small room, one wall or interspersing them amongst a similar tile. Deco Nacare Blanco is only 13”x26” and its lovely blue, gold and cream colors blend into a pattern that seems to move depending on the angle viewed from. Often, when a decorative tile is used, no other special trimmings are needed as the unique design becomes the showpiece of the room. This kitchen’s modern and elegant backsplash features Deco Nacare Blanco tiles, and can be seen in our Sanchez Street Remodel project. The designers used printed images that their clients chose and created custom wallpaper with the images superimposed over the tile to create a stunning effect. 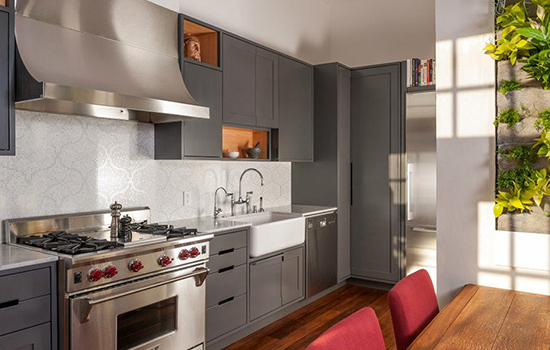 Black-and-white kitchens are popular in many homes and one way to incorporate a decorative tile into the design is by choosing Deco Matt for the wall and Prada Acero for the floor tiles. 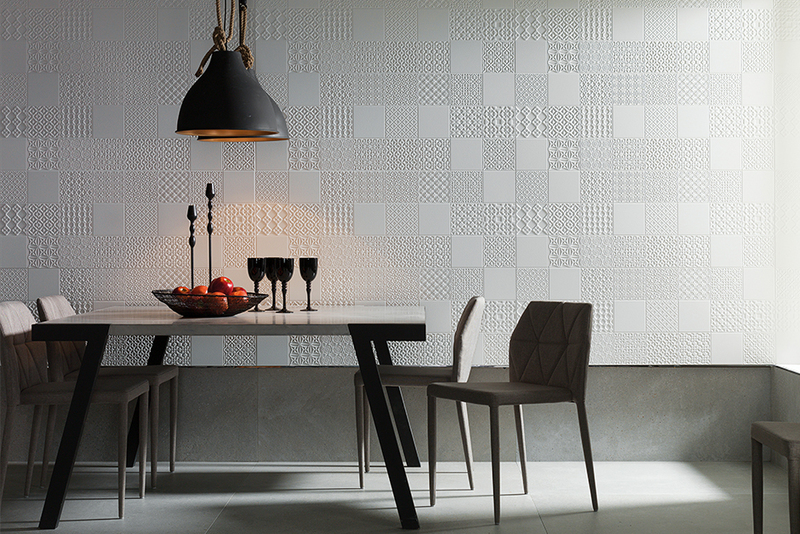 Deco Matt tiles impresses every time and never fail to strike up a conversation; Its 3D effects draw people to it, and it seems to reflect light, brightening the room. Decorative tiles add elements of style, class and sophistication whether on a small panel, a backsplash, or in an entire room. There’s every reason to embrace these playful tiles with their quirky designs and unlimited styles.